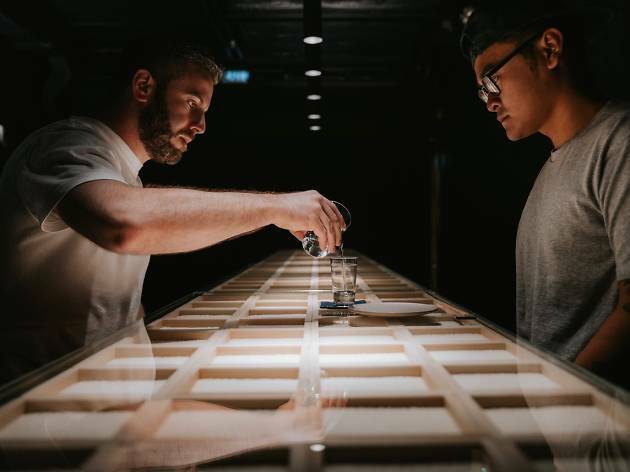 With the best selection of sake in the city, excellent small bites and service, this latest addition to PMQ should be your go-to for Japan’s favourite tipple. 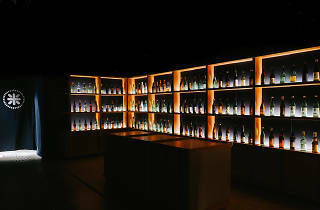 Upon entry, the dim mood lighting sets a reverent tone as guests are faced with a huge wall-to-wall, floor-to-ceiling sake collection of back-lit bottles from breweries both small and large, from Japan and elsewhere. Curated by ‘sake samurai’ Elliot Faber of Yardbird fame and Japanese culture aficionados Ken Nagai and Takashi Endo, it’s clear the range has been carefully selected. It’s possible to buy a bottle of the fermented rice liquor and drink it at one of the tables in store, but wait long enough and you can grab a seat at the ‘hidden’ 16-stool tasting bar, which we highly recommend. To find it, just dive behind the thick curtain at the back. 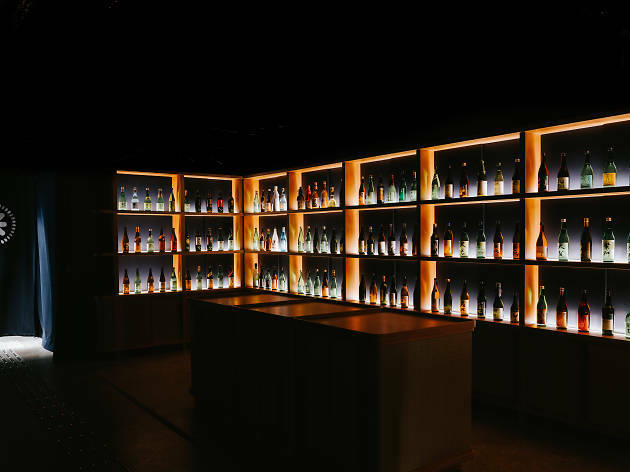 There, chef Loki Lok offers an otsumami menu of small bites and there’s a range of sake ready to be tried by the glass, tokkuri (180ml carafe) or full bottle. We start with a bottle of karakuchi (essentially, ‘not sweet’) from Nagano Prefecture’s Masumi brewery ($230). 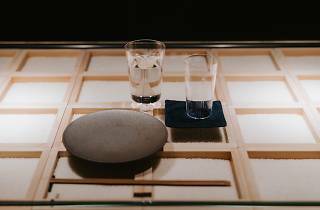 It’s a straightforward dry sake with medium body which primes our taste buds for what’s to come when we’re presented with our plate of delicious pickles ($98). Among the preserves, there’s lotus root, water chestnut, celtuce – the stem of Chinese lettuce – and cucumber. They’re a welcome refresher and contrast superbly with the fruity karakuchi sake. Moving on, we order Dewazakura in a tokkuri ($130). This sake comes from Yamagata Prefecture and, with its dry herb notes, pairs well with the next dish, the vegetarian-friendly ganmo ($48). A deep-fried ball of tofu and vegetables in a moat of deeply satisfying seaweed-infused dashi, it’s a crispy, creamy masterpiece which induces moans of pleasure from our party. Come the end, any remaining dashi is duly dispatched straight from the bowl. We finish the meal with a tokkuri from Okinawa’s Taikoku brewery ($150), which is served warm to loosen the tight texture and release the aromas. 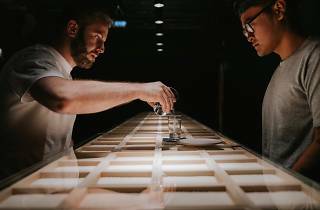 This stronger sake stands up well to the richness of the superb agnolotti ($78) – neat parcels of slow-cooked pork belly served in a sweet and sticky soy-heavy reduction made from the pork’s braising liquor ­– which arrive at the same time. It’s at this stage we ask about the grid of wooden boxes that sit inside the glass top counter. 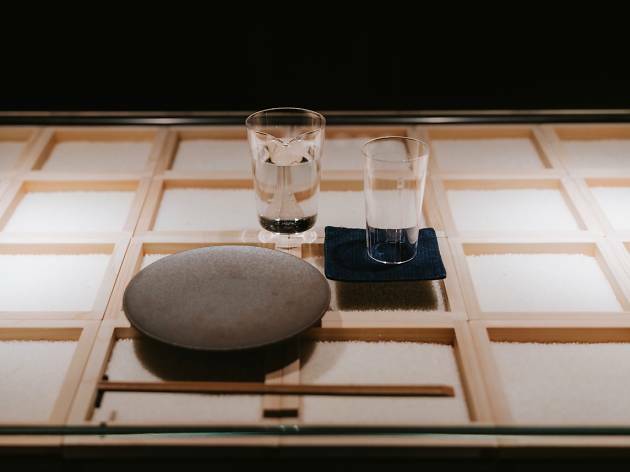 We’re informed they’re filled with sake rice at various stages of polishing and that different grades are used to brew different styles of sake. All our questions are patiently answered, staff happy to educate so that any customers who need a recommendation on their first visit, can come back and choose their own favourite style next time.